April | 2012 | shigekuni. What struck me about The Development was the transformation of every single instance of the singular inanimate possessive pronoun “its” into (the orthographically regular but culturally deprecated form) “it’s”. (…) The experience of reading this work left me with the familiar problem of attributional abduction: trying to find the most likely explanation for some puzzling aspect of a published work. Could Barth have done this on purpose, perhaps to make a point about the arbitrariness of writing’s cultural conventions? Did he mean to insert one apostrophe into a mis-typed “its” and mistakenly change every similar string in the whole manuscript? Or was the error (if it was an error) introduced by a copy editor or someone further along the chain of production? However, he then checks the print edition and finds none of the changes he found so delightful. The rest of the post, and the comment section then goes on to delightfully explore the deplorable copy editing practices of amazon and what it means for books and what the hell Barth actually wrote. Read it all here. You can also find discussions of The Development at The Fictional Woods, a forum for readers of all stripes. A german post for once: Herta Müller reacting to the Günter Grass affair that recently erupted over a ‘poem’ he published. Die Literaturnobelpreisträgerin Herta Müller hat die Äußerungen von Günter Grass zur israelischen Politik scharf kritisiert. Am Rande einer Lesereise nach Tschechien sagte sie in Prag, Grass solle sich lieber zurückhalten: „Er ist ja nicht ganz neutral. Wenn man mal in der SS-Uniform gekämpft hat, ist man nicht mehr in der Lage, neutral zu urteilen“, so Müller über ihren Nobelpreis-Kollegen. Die Kritik äußerte sie auf einer Pressekonferenz im Prager Goethe-Institut. Sie habe von der Debatte um Günter Grass wegen ihrer Auslandsreise erst aus den Zeitungen erfahren. Sie halte Grass’ Äußerung nicht für ein Gedicht: „Wenn er ehrlicher wäre, hätte er einen Artikel geschrieben. Will er, dass es Literatur ist und damit interpretierbar? Dort steht kein einziger literarischer Satz drin, also ist es ein Artikel“, sagte Müller. 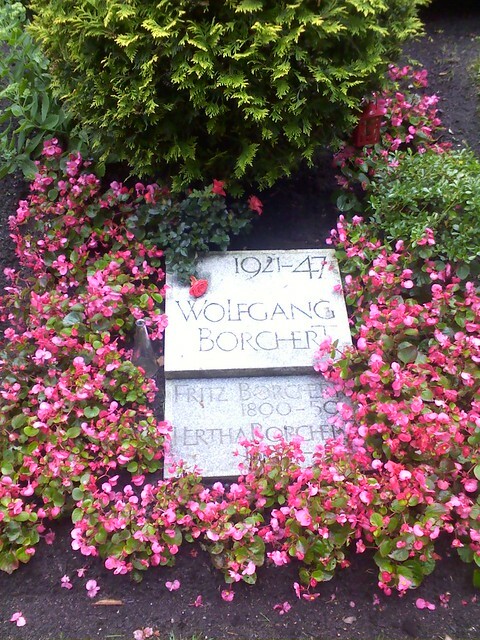 The great, great, great Wolfgang Borchert’s small, unassuming grave in Hamburg. I don’t believe in ironic appreciation. The campy-listening thing, I think, is false. I don’t think that there is any such thing, actually. This happens with age, that at some point you might have told yourself and others that you listened to the Backstreet Boys because it was funny. But in fact, you were enjoying it; it’s just a different kind of enjoyment for you. But I don’t think that ironic-distance appreciation is actually a different or lesser appreciation. I think most of that irony is an attempt to say, “These aren’t exactly my kind of people, and I don’t picture myself sounding like that, but I still like it.” I don’t believe in ironic appreciation. I think if you like something, the core of it is you like it. It was the darkness that got you. It was heavy darkness, greasy and compelling. It made walls round you, and shut you in that you felt you could not breathe. You wanted to beat at the darkness and shriek to be let out. And after a while you got used to it. Of course. And then you stopped believing that there was anything else anywhere. from a letter Kurt Vonnegut sent to a school principal who had his books destroyed for ‘obscenity’. Read the full letter here.